New issue investment grade corporate bond market continues to run hot. With the Fed expected to take out a chunk of spread product out of the market, investors are chasing quality paper and willing to accept historically low rates. LCD: - Caterpillar Financial Services floated guidance in the T [treasury yield] +40 area for new three-year notes and in the T+60 area for new five-year notes, including ranges of five basis points on either side of the midpoints, sources said. The SEC-registered issues come off the medium-term note program. In June Caterpillar's five-year notes priced at T+80 - which at the time was "among the 20 lowest rates ever inked". Now the same bond will price 20bp tighter. Note that at the current treasury yield investors are taking Caterpillar risk for 5 years to receive about 1.35% per year in total coupon. This is below some 5-year FDIC-guaranteed CDs (Barclays will pay 1.7% on a 5yr CD). CAT is a strong company, but most individual investors would generally prefer FDIC risk, particularly at a higher rate. The point is that 1.35% is just ridiculous. 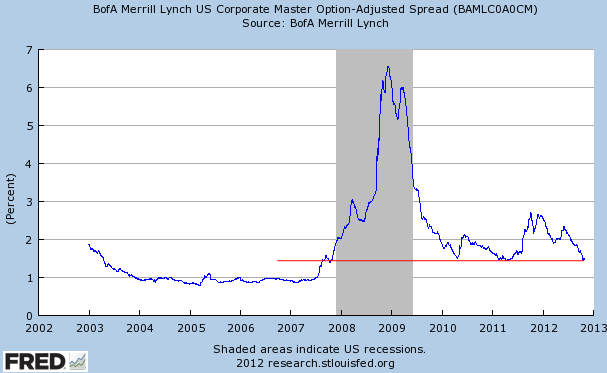 Investment grade spreads are now back at the multi-year support. Much below that and we are entering the "bubble period" (pre-recession) levels. If the Fed has its way, we are going there.